We picked up a bolt of the new September Blue in Lawn today from Dashwood. We couldn't resist cutting straight into it before it even made it to the shop! There's a real fabric trend into other 'substrates' ( got to love using that word whenever you can!). 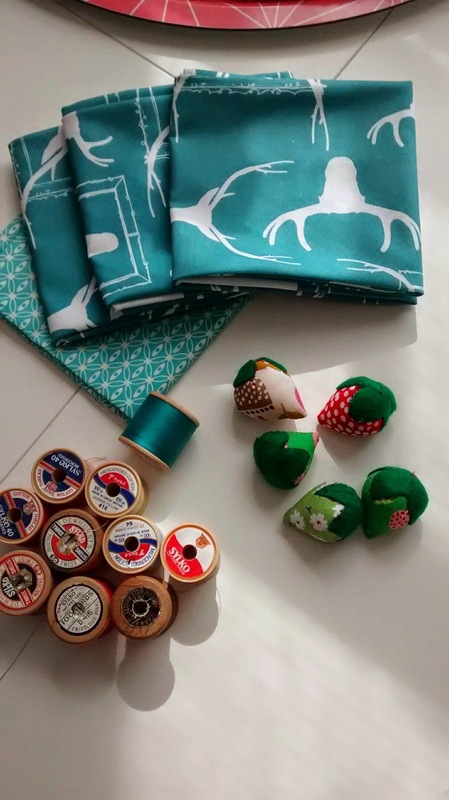 There will be so many Lawns, Voiles, Rayons and other great fabric types about next season and we're loving the choice it brings and have some fab fabric on order and great projects to use them through the autumn. I've always been a huge fan of lawn. 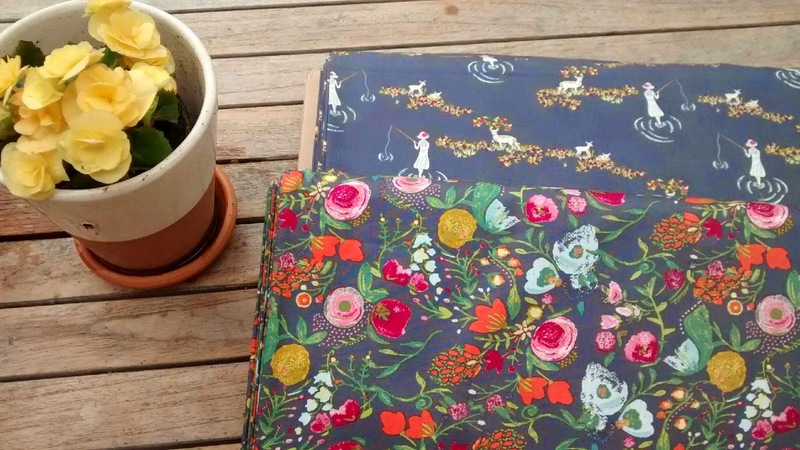 Obviously Liberty fabric is most famously available in a lawn and I've used it for dressmaking, quilts and the occasional luxurious homemade hankie! 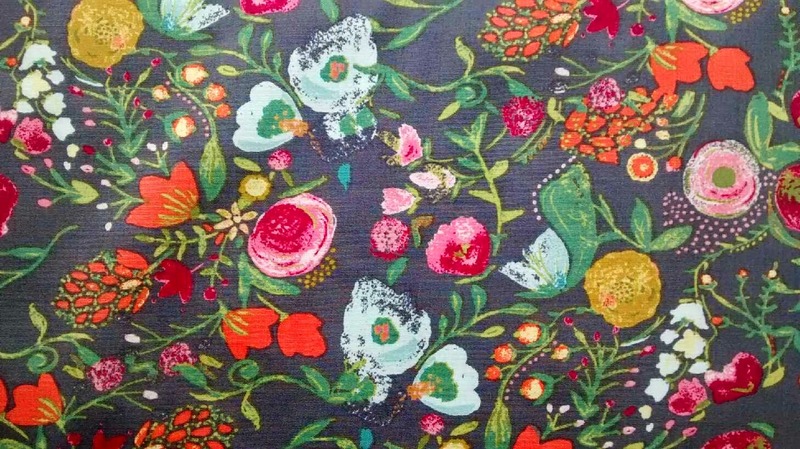 Anna Maria Horner was one of the first designers to embrace the options of other fabric types. 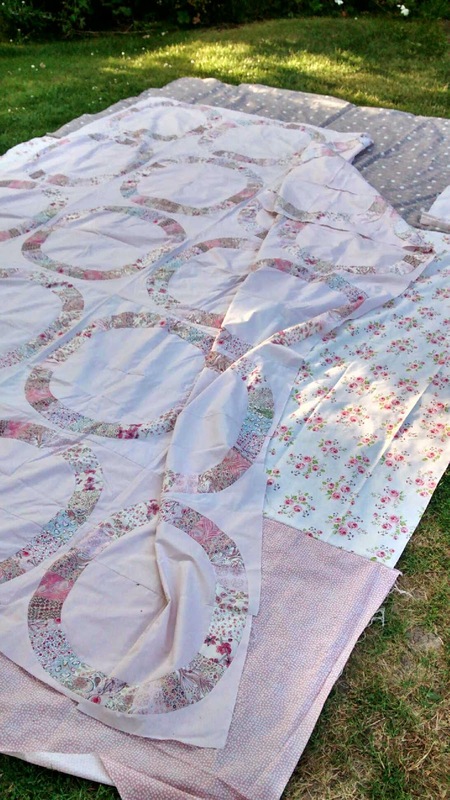 Her Little Folks Voile was a real favourite of mine.I made a favourite quilt with the softest buttery feel to it which still sits over my kitchen chair. I love a quilted lawn. I just dropped off at the long arm quilters a quilt I made about 5 years ago, I made the top and never finished the quilting. It's Liberty lawn, Single Wedding Ring to the modern pattern Single Girl by Denyse Schmidt. I loved making it. I don't really know why it never got finished. I think I had a baby. It can really mess with your WIP scheduling you know! I'll share it when it comes back. I'm really excited about having it finished at last! Anyway, I digress. Lawn. I love it. Turns out so do my girls. They see a lot of fabric which means they are pretty much my most discerning customers. This one they LOVED. It feels so nice. It's such a nice blue. It's got little pink birds on it. Mummy can we make a skirt? By the time we stopped the car on our drive we had it all planned out. September Blue Lawn. A light grey voile we had in stash as a lightweight summer lining. 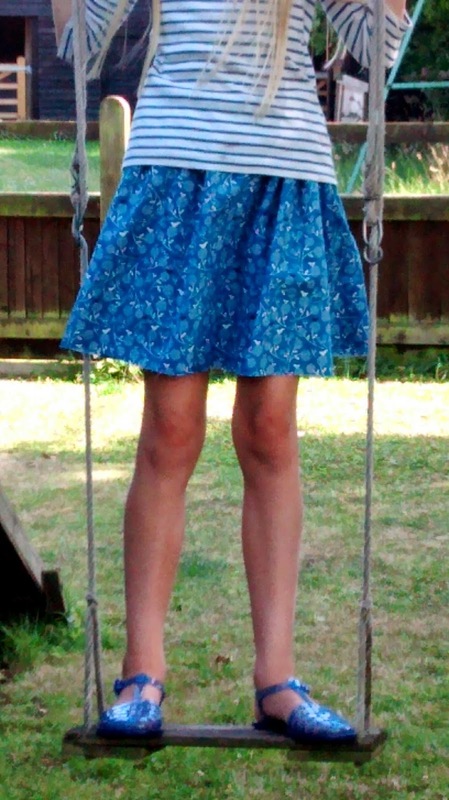 A free pattern from Kaufman that we always return to for a quick easy summer skirt - try it it's a doddle and you can whip up a whole batch if you have lots of daughters/ their friends round/ neices etc! I love teaching our summer holiday kids classes. I get to hang out with my biggest Girl who teaches the class alongside me, she's 11 and has a serious amount more credo with the girls than me, you know! These classes are always such a blast. Often times the girls have never sewn on a machine before. No probs. Foot down and away they go. The confidence of youth. How hard can it be when, you know, you've spent the morning building a whole new world on minecraft? (!). They just don't sweat it like we grown ups do. They figure that they'll be fine and they are. We should all Think More Kid now and again don't you think? We had a laugh, some cake, and some serious frowny concentrating faces and two hours later we had a pile of delicious pillows ready to be taken home, chucked on the bed and flumphed into for a bit of cool afternoon summer holiday book reading..........what could be nicer? New bed linen and a good book? Yesterday was one of those wonderful whirls of a day in The Workroom. There's just so much amazing making going on around our classes. Every day brings a new excitement as someone shyly reveals their work in progress. The Farmers Wife class is one of my favourites and it's turning out some of the most amazing work. Yesterday a lady from my class bought her work in progress into the Workroom and we literally gasped it was so beautiful. She said that she'd never sewn a stitch 2 years ago, but Simple Sampler followed by Farmers Wife had opened up a whole new world for her. Someone else came in and asked about classes - where do you start she asked? How do you choose? We're really proud of the array of classes that we offer. But scrolling through the classes for the autumn I can see why you might get overwhelmed! Why would you choose this class? This class is for people who love hand sewing. It's made completely by hand in little bite sized 6 inch block chunks. 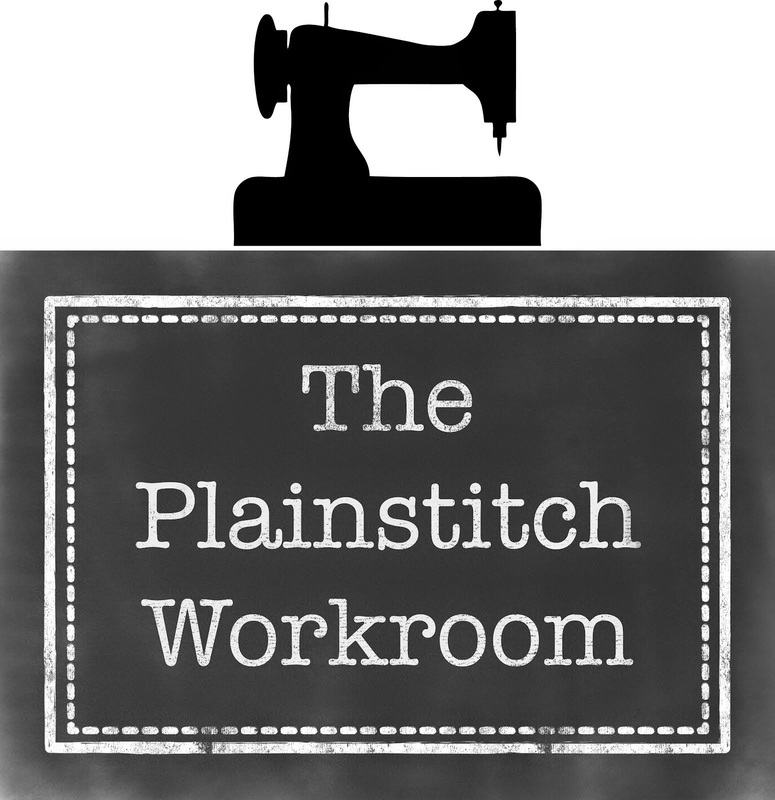 This class is for people who like to chat while they sew! It is a class that runs for 9 months, meeting once a month to sew for 2 hours. However these classes become little friendship groups in themselves. Come to any Bee and there will be a chatty Farmers Wife table getting on with their blocks whilst have a good old natter. 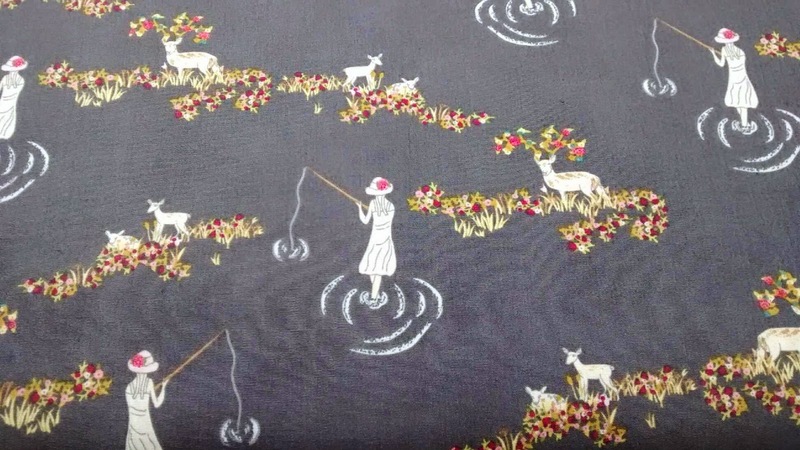 The beauty of hand sewing is that it is completely sociable, and portable. 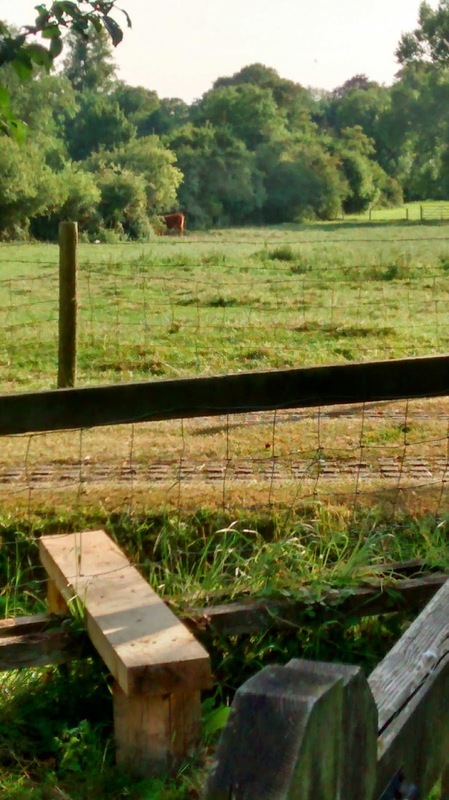 I can't promise that Farmers Wife won't take over your life because it's the sort of project that you wake up in the morning thinking about....but it will certainly fit into your life. You can take your blocks anywhere - there's lots of sewing on commuter trains, in the car while waiting for kids, in front of the TV in the winter. This year we are running an evening class (Tuesday evenings) as well as a morning one (Tuesday mornings) for those of you who work or have daytime commitments. 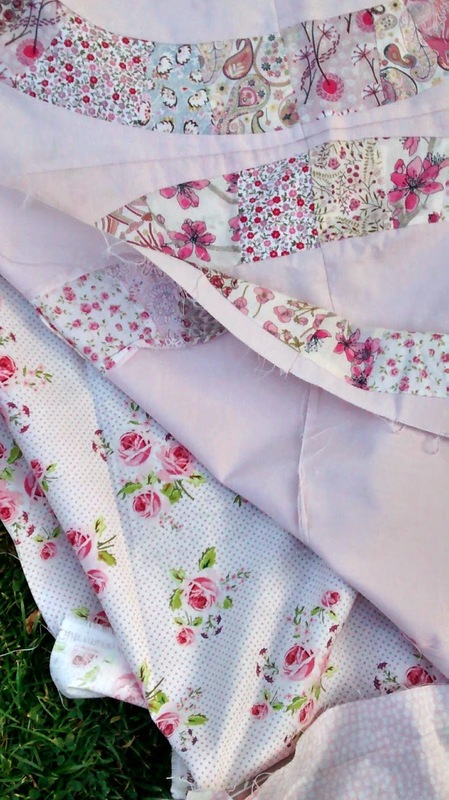 This is the perfect project to do if you work full time as its only once a month, can be taken anywhere, it's commutable and lunch-breakable sewing! Why is it called The Farmers Wife Quilt? This quilt is made up of small 6 inch blocks. No block is repeated ( although lots of people make multiple versions of different blocks as it's too irresistible to not repeat favourites!). In the class we make 64 or 72 blocks. The blocks are divided up into Fun, Fiddly or Fiendish and you can pick and mix depending on your mood or as your confidence grows. You don't need lots of patchwork, or sewing experience. 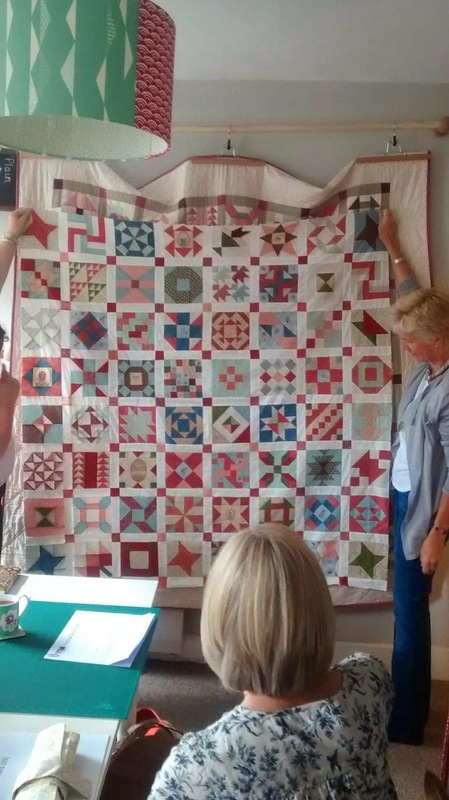 Although this quilt can look daunting, it comes together in small chunks so you can definitely 'learn on the job' as you progress through the quilt. If you've already completed Simple Sampler you'll love this class- it's the perfect follow on project. 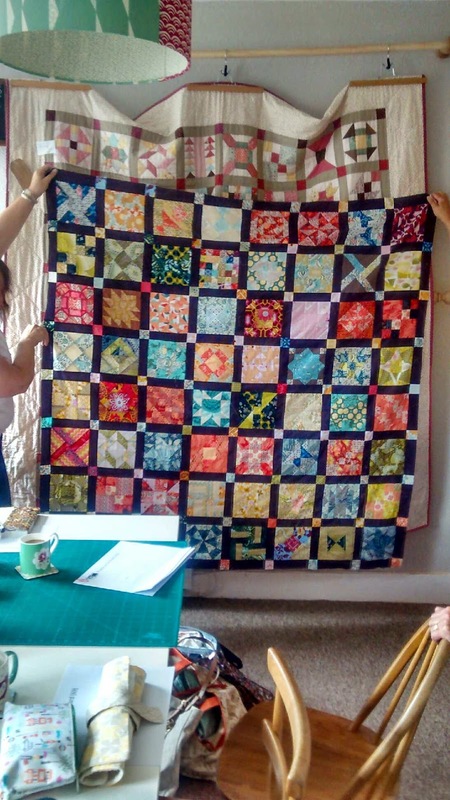 We're really proud that the last class is turning out 12 of these wonderful quilts, many made by women who were worried that they'd be unable to make it - but now so proud of their work! It's all made by hand. This means hardly any equipment, it's not much more than just a needle and thread and a bit of beeswax. 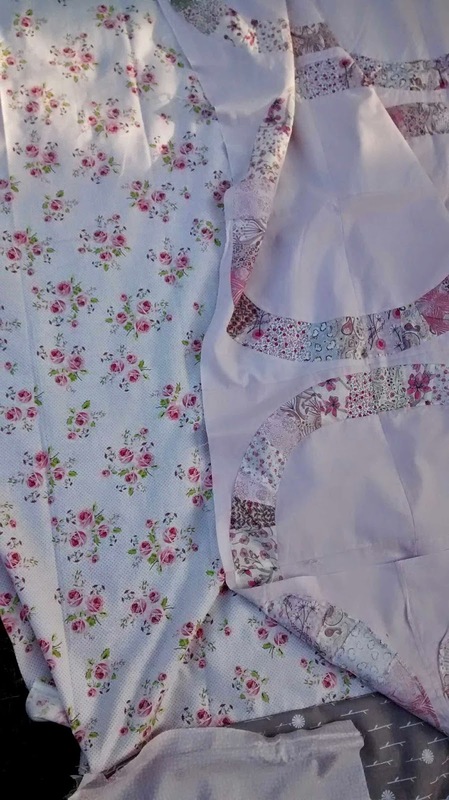 No need to haul the machine out on the kitchen table so no one can eat meals!It's simple, old fashioned sewing at it's best - but it makes a classic modern quilt. If you would like to enquire about joining this class drop me an e mail or use the Get In Touch box in the side bar. The class starts in Sept.
.........and exhale. The frenetic end of term tumbles to a halt and the pace of life suddenly dramatically slows. My lovely lovely kids home for the summer. The weather here is wonderful, soft cloudy mornings, perfect for a dog walk. Swishing through the shoulder high parched overgrown field boundaries. Our Pups leaping up in the air to see, to check we're coming, she's bounding over the corn as we walk behind, she twirls around with sheer doggy joy. 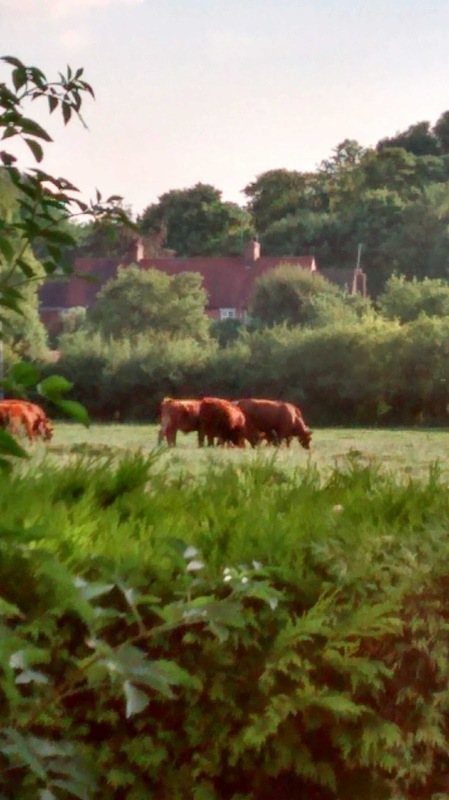 My kids, getting taller all the time, in single file as the nettles aren't kind to bare brown legs, walking ahead of me in size order. They're so big now. Gulp. We walk, swinging a stick, chattering, listening for fairies as we wind our way gratefully through the shelter of the shady hollow, our favourite part of this oh so familiar walk. worth the view at the end - the vale spread out before us. Not today, the heat drives us back into the shade. Slower on the way home, wet from the stream, little sticky seed pods stuck to our clothes and itching our backs, probably a nettle sting or two, spirits of the smallest flagging, back into our field, chirping with crickets, the hay cut and drying on the ground, waiting to be baled at the weekend.....my favourite time of year. The day stretching out ahead of us, settle down in the shade in the garden, chickens digging dust baths, paddling pool full and sparkling, a pile of quilts, piles of books and bags of loom bands, the shed to sweep out and turn into a shop, plans to paint the tree house........lovely High Summer Holidays.. In the school holidays I just love teaming up with my biggest girl to teach a class together for kids. 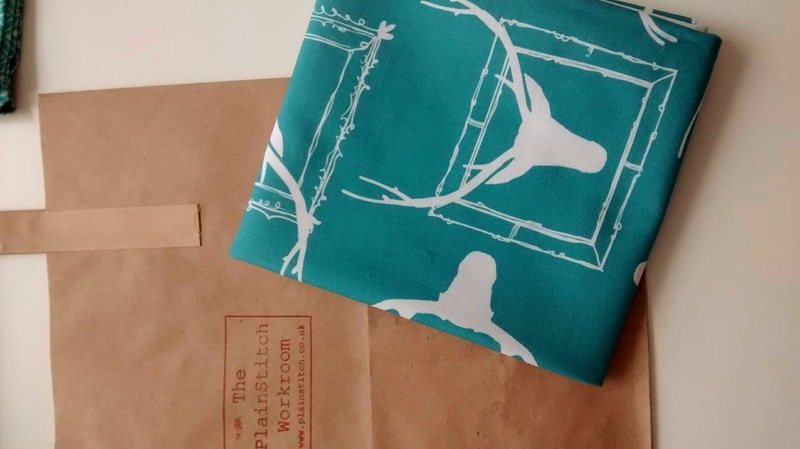 We make pillowcases for your bed as it's a fun, colourful, straightforward make on the sewing machine and you get something super useful at the end. My daughter quite rightly pointed out that the correct description of the class was 'Bring a Grown Up and Make a Pillow Class' ....so that's what i'm calling it. The class is for kids aged 7+ with an accompanying adult. If you know a little boy or girl who'd like to make a pillowcase, why not offer to be their grown up? Its a lovely two hours to spend together. We have one space left on each of these sessions on Tuesday 29th and Tuesday 5th August. Drop us an e mail if you'd like to join us. Just a little post to let you all know that the much anticipated Emmy Grace Greys have now arrived to complete the range. We have a pile of pre-orders to fulfill so if you are thinking you might want a bit before it all goes do let me know asap. It's even lovelier than I remembered btw! 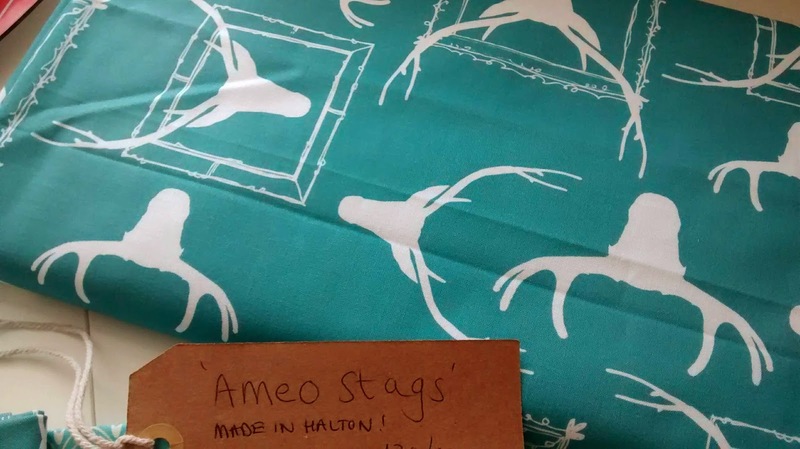 First Vickie arrived with her much anticipated Fabulous Ameo Stag Fabric. Doesn't it look fabulous? 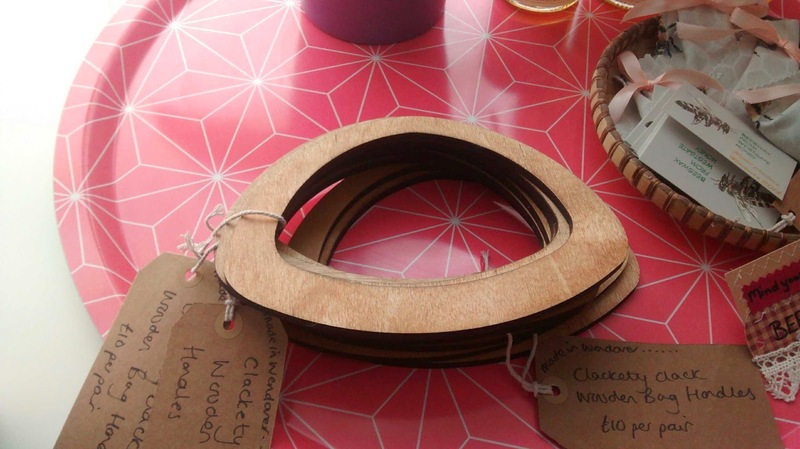 I'm so excited about stocking this at The Workroom - Designed and made in Halton, Bucks! Local Fabric! We're selling fat quarters, half meters and meterage while stocks last. Next a local fellow English Paper Piecer popped in and we had a lovely chat about piecing papers....more on that soon. 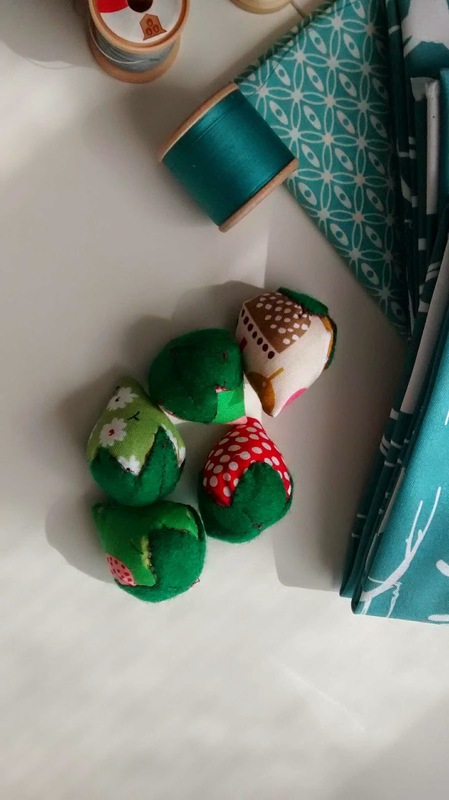 Then a dear dear sewing friend with a gorgeous pressie - handmade fabric strawberry mini pin cushions! Adorable! The perfect gift - I was so grateful. Plus look at the fab selection of vintage cottons she picked up in the charity shop up the road on the way! What a find! Then more lovely friends, students from Simple Sampler, bearing flowers and handmade cards - tears! More old Simple Sampler friends popping in for a cuppa and telling tales of new projects, off to the Long Arm Quilter this week - so many wonderful quilts being made! Of course they all left with very tempting bags of fabric loveliness. 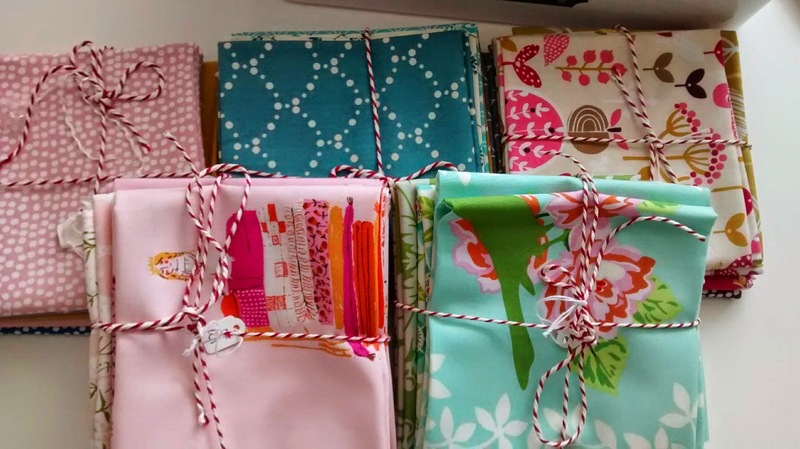 We've got so much delicious fabric at the moment and the bundles are selling like hot cakes - Heather Bailey, Heather Ross, Emmy Grace, Retro Orchard, September Blue - aren't they pretty? 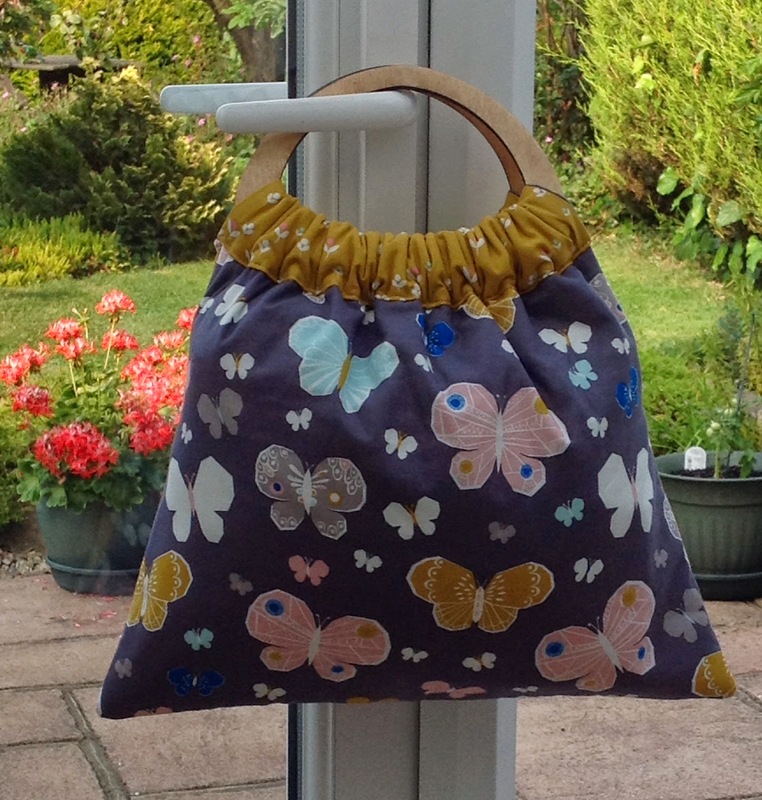 Friday and Saturday were two of the hottest days of the year so far this year here in the UK but in The Workroom it was Granny Bags that were roasting hot! This class sold out in a week when we announced it in June and it's been hotly anticipated for the 6 weeks since we opened booking. You know by now that I love a Granny Bag? I've been so excited about these classes. People who don't perhaps know about my secret sewing life have been asking me all week - 'Oh it's such a downer when you get home from holiday?' and I'm, like, 'Oh no it's fine, I'm making Granny Bags all weekend!' and they're, like...'Oooo-kay' back slowly away from the crazy laydee!!!!! Tell me that you can go on without a Granny Bag of your own?! You see? I'm not the only one - these Granny bags were LOVED by their proud owners. If you know a nice lady who was coming on this class, and she's told you that she's making YOU a gift...I have sad news. They WILL NOT want to give these away! Some craft is too special to gift! If you can't live without a Granny Bag ( It's OK to admit that here - we all understand!) 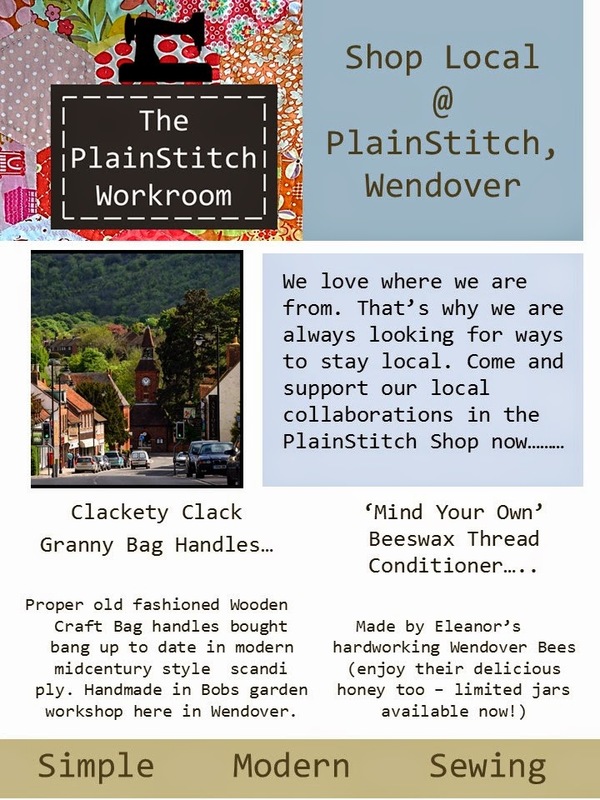 then the good news is that we are running another class on Thurs 11th Sept from 10am - 1pm ( and another Pop Up Vintage Purse class on Sat 13th 10.30pm - 1pm) so book quick before the places all go, they are already busy with peeps who missed out in the first lightening quick sell out. 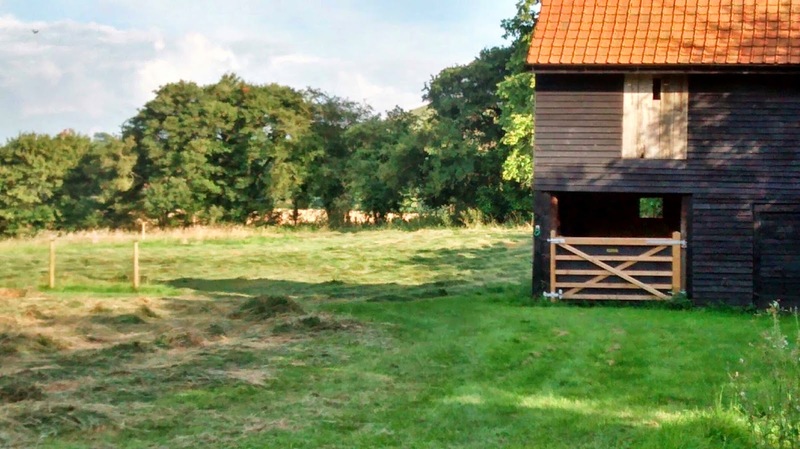 We're lucky enough to live in a wonderful village, perched up in the Chiltern Hills in Buckinghamshire, north west of London. 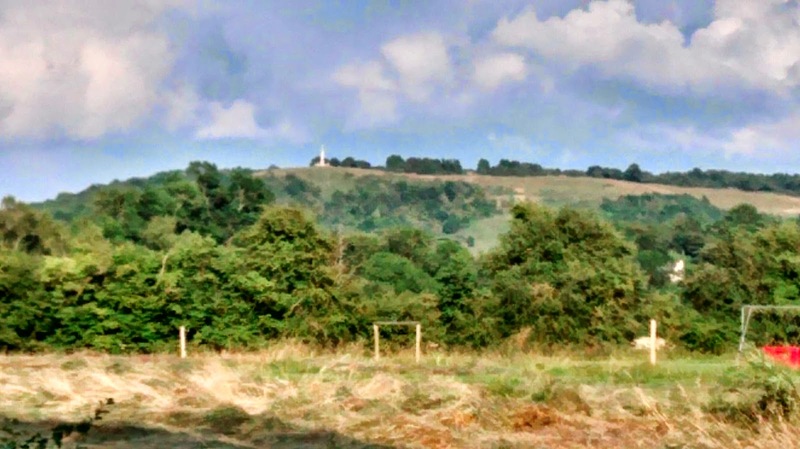 It's an Area of Outstanding Natural Beauty and we are surrounded on 3 sides by woods and the rolling hills of the ancient Ridgeway as it snakes it's way south along the chalk downland. Wendover is a busy village with a pretty High Street. If you look up above the shop fronts you see wonderful buildings from the timber framed pubs to perfectly symetrical Georgian houses. We get to look down on the busy High Street from The PlainStitch Workroom, up on the first floor of a lovely Georgian townhouse. We see friends and family coming and going along the high street, popping into the post office, walking up to the weekly Thursday market. We love Wendover. We think it's a special place. We like to shop local and believe that it's important. We're really proud to show you some of our recent local collaborations. Eleanor lives in Wendover. 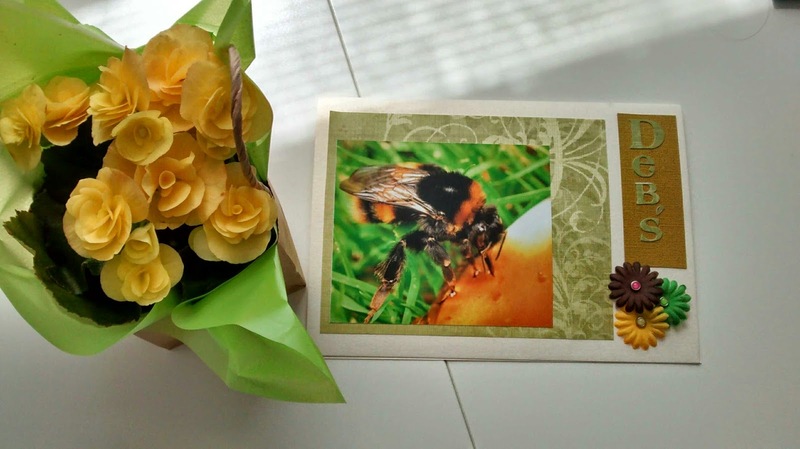 She and her husband Paul keep bees in their garden. We use lots of Beeswax at The Workroom as a thread conditioner to stop threads twisting and knotting when we hand sew. We asked Eleanor if she would supply us with Beeswax. She was delighted to and now you can buy her perfect little nuggets of golden beeswax in a fabric pouch at The Workroom. They look fab ( a lovely gift for a sewing friend) but best of all they smell divine! A mixture of honey and warm summer - I promise you this little beeswax will conjure up summer for you in the middle of next winter - if that's not worth £4 I don't know what is! Come and have a sniff for yourselves before we sell out. 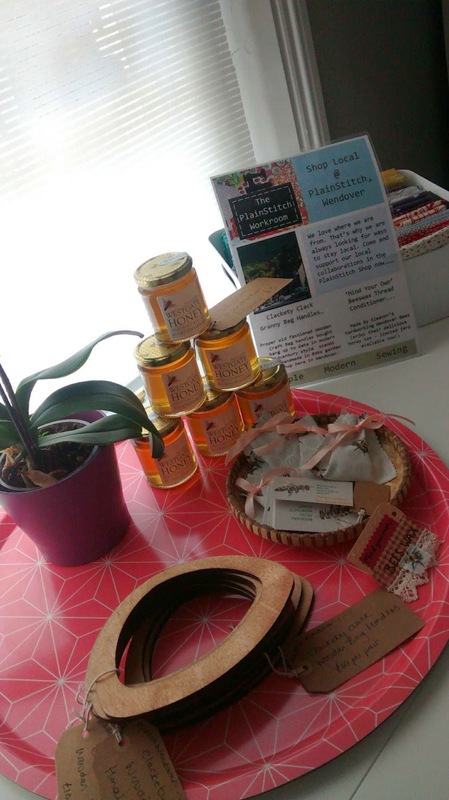 We also have a limited supply of their lovely honey - look at the colour of it - we won't have it for long so if you fancy a jar ( local honey is also brilliant for hayfever sufferers btw) do pop in and get one before they go. Check out their facebook page to see the honey being made. 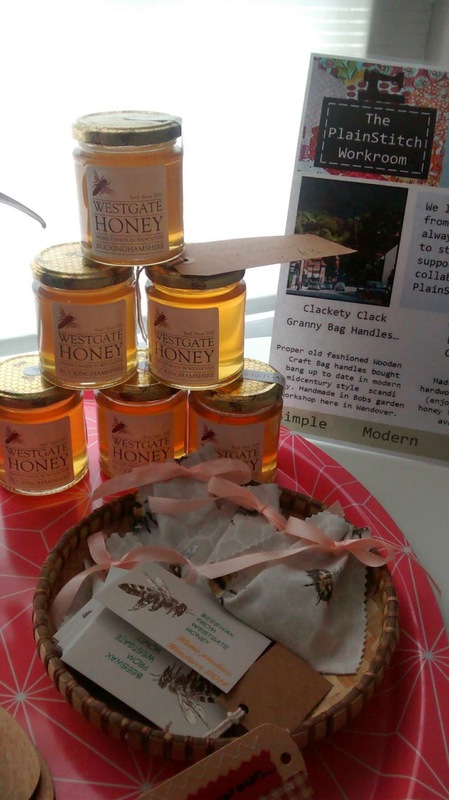 Our other lovely local collaboration has been in hot demand today at our Granny Bag class. If you've been reading the blog you'll know that recently I was seized by a strong conviction that I HAD to have an old fashioned clackety-clack handled craft bag like my Nana used to keep her knitting in. Despite an extensive charity shop search no such thing could be found. I decided to make my own - but I couldn't find a wooden handle that made that magical comforting clack. Bob lives in Wendover, in fact he's the Chairman of the Parish Council. He has a workshop in his garden where he makes wooden ornaments and puzzles and toys with his company Wendover Wood. We asked him if he could make us a modern sleek scandi inspired pale wood handle. He said he could and 45 mins later he popped back in to the Workroom with the first prototype. We loved it, and so do our customers. 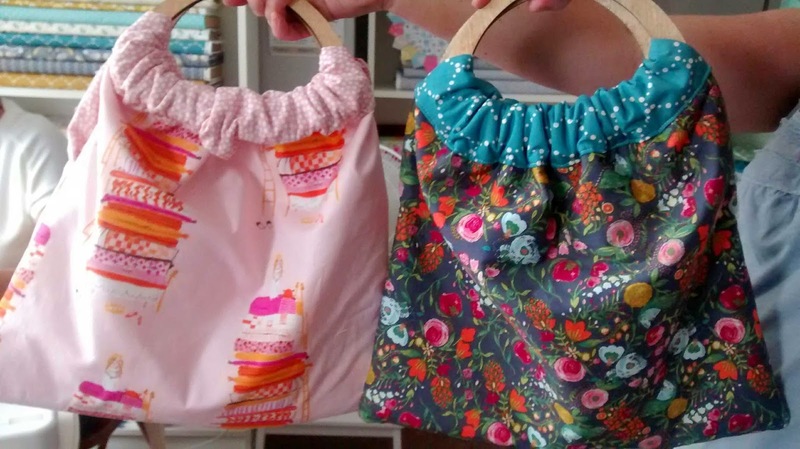 In my next blog post i'll be sharing the 15 or so fabulous Granny Bags that we made in the last 2 days. We'll be running another class on Thurs 11th Sept 10am so if you'd like to come along and make a modern vintage craft bag drop us a note as this class sold out in a week this time around.